The meeting between the LJP and BJP was seen as a way by the latter to pacify the sulking allies ahead of Lok Sabha elections 2019. New Delhi: Politics heated up in Bihar as Upendra Kushwaha, who had severed his ties with the Bharatiya Janata Party (BJP) a few days back, joined the UPA fold on Thursday. 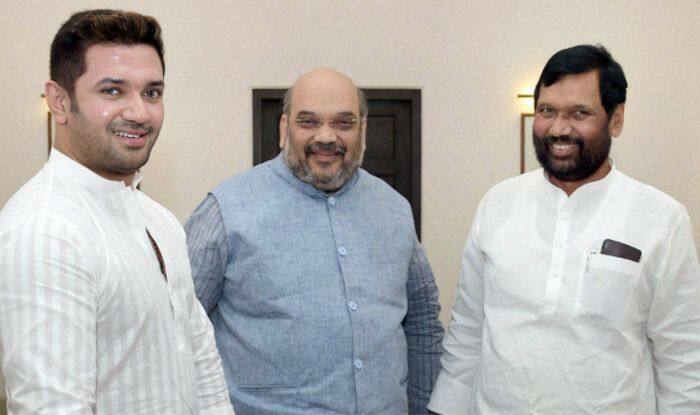 Soon after the announcement, Union Minister and Lok Janshakti Party (LJP) chief Ram Vilas Paswan and his son Chirag Paswan met BJP President Amit Shah, amid reports of being upset with BJP over one Rajya Sabha seat promised by the party months ago. The meeting between the LJP and BJP was seen as a way by the latter to pacify the sulking allies ahead of Lok Sabha elections 2019. During the hour-long meeting between top BJP leaders, including its president Amit Shah and Finance Minister Arun Jaitley, Chirag Paswan reportedly asked the central government to explain what benefits demonetisation brought to the country. Chirag, as per a PTI report, had written a letter to Jaitley with a copy to Prime Minister Narendra Modi after the results were announced on December 11 and asked him to list the benefits of demonetisation so that he can “explain” them to people. Furthermore, he had also tweeted about the ruling National Democratic Alliance passing through “trying times”. However, Ram Vilas Paswan has refuted reports of discontent with the BJP over seat sharing and said that Chirag is the chairman of the Parliamentary Board and he will decide on the issue. “There is no animosity, whatever is our decision, will be taken by Chirag,” he said. This is not the first time that cracks have appeared between the ties of LJP and BJP in Bihar. Earlier, Chirag had also aired his frustration with the delay in seat-sharing announcement and said it may harm the ruling alliance. As quoted by PTI, sources claimed that the LJP wants a better deal than the BJP has offered it, more so after Kushwaha’s exit from the alliance. Furthermore, it is believed that the BJP’s defeat in the recently concluded Assembly Elections 2018 in five state have ignited a rethink in the party over its ties with the saffron party. On Wednesday, Ram Vilas Paswan, wary of being allotted fewer seats in NDA to contest in next year’s Lok Sabha polls than it has been demanding, gave the BJP an ultimatum of December 31 to finalise the seat-sharing scheme for Bihar. Ahead of Thursday’s opposition meeting in the national capital, RJD leader Tejashwi Yadav tried to lure the LJP to walk out of the NDA to join the ‘mahagathbandhan’. Referring to Ram Vilas Paswan as his ‘guardian’, the former deputy CM of Bihar said if Paswan’s party wasn’t happy with the BJP’s way of handling things in the alliance, it should walk out of it. Earlier, RLSP chief Upendra Kushwaha also advised LJP to snap ties with BJP immediately. “BJP is bent on destroying small regional parties. The sooner LJP quits NDA, the better it is for it,” he said.